It's a great time of year for sports fans and their pets! While you're watching the big game, there's no reason you can't include your pets in the fun, too. One of the ways you and your pet can enjoy sports together is through festive snacking. You can come up with all kinds of creative ideas, from healthy snacks to special, indulgent treats. We asked Dr. Leslie, Big Heart Pet Brands' in-house veterinarian, for some fun tips on snacking with your pets during the big game. Q: Is there ever a time when it's OK to give a pet "people food" as a snack, like during a big game? Dr. Leslie: Ingredients used in human food are the basis for ingredients used in pet food. Most foods are OK for dogs, so long as they are fed in proportion to their dietary needs. 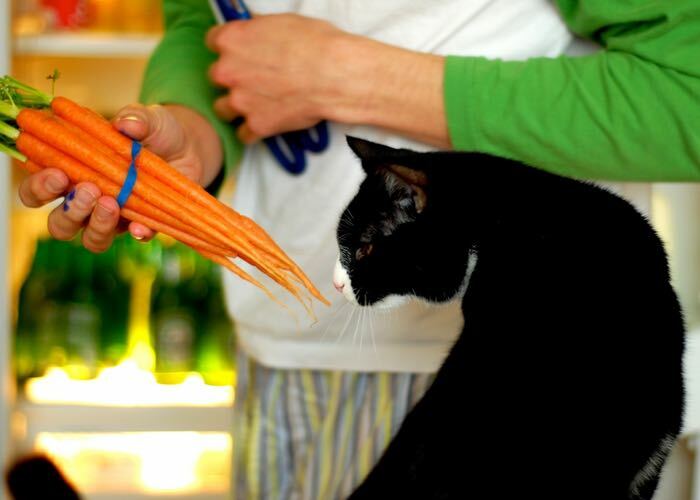 Often fresh fruits and vegetables make great, low-calorie treats and snacks for dogs and cats. Q: What kind of healthy snacks would you recommend for my dog or cat on a special sports occasion? Dr. Leslie: Some great snacks are baby carrots, blueberries, blackberries, peaches or bananas. Avoid foods known to be toxic to dogs such as onions, garlic, grapes, raisins, etc. Q: Sometimes I just want to let my pet indulge a little. How often can I give my dog or cat a snack that's not quite as healthy? Dr. Leslie: Having an allowance for spare calories allows you to give your pet a little bit of an indulgent reward every day. Find out what 10 percent of your dog's or cat's daily calories is and make that their allowance. Then be creative and fill it with lots of light, healthy treats or one or two high-reward treats. Q: Should I decrease my pet's dinner portion if we're having a big snack day? Dr. Leslie: Yes — try to make sure that at least 90 percent of the calories come from a balanced diet, and then have fun with your remaining allowance. Q: Can my pet get sick from eating too many treats on game day? Dr. Leslie: Yes. Some dogs don't tolerate high sugar or high fat foods very well. In addition to having an extra full belly, which is uncomfortable, some dogs can develop inflammation of their pancreas if they have too much fat in a short period of time. The pancreas is responsible for producing fat digestion enzymes and can become overworked. Pancreatitis can be mild and result in tummy upset and diarrhea, but it can also be severe causing shock and even death. Q: What's your favorite snack to give your pet during a game? Of course, there's an easier way to treat your pet on game day. While you're planning your sports viewing party, consider surprising your dog with Pup-Peroni® Triple Meat Lovers with Bacon, Sausage & Pepperoni Flavors, and your cat with Meow Mix® Irresistibles® treats. Photo Credit 1: "Lick" by Richard Kelland via Flickr. License info. Photo Credit 2: "Can I haz carrots?" by chispita_666 via Flickr. License info.